DENVER, Feb. 14, 2018 /PRNewswire/ -- DaVita Kidney Care (NYSE: DVA), a division of DaVita Inc. (NYSE: DVA), a leading provider of kidney care services in the United States, supports National Donor Day and its patients with kidney disease by asking Americans to commit to organ donation. "Today, nearly 120,000 patients are on the waiting list to receive a life-saving organ transplant and more than 95,000 of those are waiting for a kidney," said Bryan Becker, MD, MMM, FACP, CEP, chief medical officer for DaVita Integrated Kidney Care. "On behalf of DaVita, we ask that you make a difference in the life of a patient by becoming a donor this year." When kidney function fails, a person has to undergo regular dialysis treatments which filter toxins from the blood or receive a kidney transplant to survive. Advances in technology, medications, surgery techniques and donor matching have made kidney transplants a viable option for more patients. However, the number of kidneys available are far less than the number of patients on the list. This results in a median wait time of 3.6 years, but that can vary depending on geographic location, health or compatibility. According to the United Network for Organ Sharing (UNOS), a person of any age can be an organ donor and a registering organ donor may save as many as eight lives. Living donation is also a possibility for healthy individuals over age 18 looking specifically to donate a kidney. The balance of risks and benefits for a kidney transplant varies depending on age and other health factors. 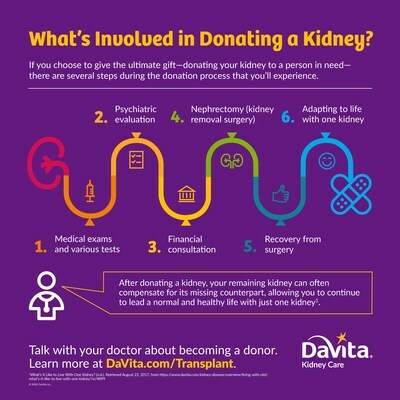 To find out more information about kidney transplantation, getting on the transplant wait list or becoming a donor, talk with your doctor and visit DaVita.com/Transplant.